Page revised in December 2009. 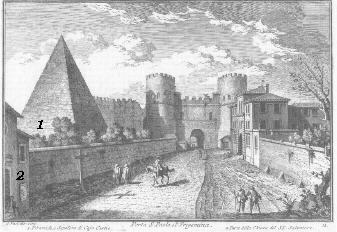 The plate shows one of the most amazing monuments of ancient Rome: the pyramid built in 13 BC by a wealthy Roman to house his burial chamber; with the nearby gate it forms a complex which seems to have been designed on purpose. Actually the gate was built three hundred years later. At Vasi's time the importance of the gate was rather limited; it was used by pilgrims to reach Basilica di S. Paolo and for this reason the gate is mainly known as Porta S. Paolo. The view is taken from the green dot in the small 1748 map here below. In the description below the plate Vasi made reference to: 1) Piramide di Caio Cestio; 2) Part of the church of S. Salvatore. 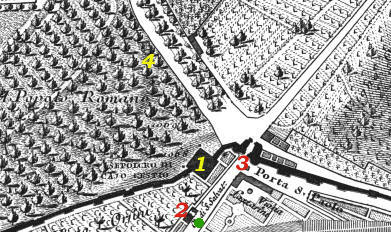 The small map shows also: 3) Porta S. Paolo; 4) the approximate site of Fabbrica delle Polveri which was completed in 1752. In 1920 the area south of the walls was chosen for the development of Borgata Giardino, a new quarter which is now known as la Garbatella; in 1936 a hill further south was selected for the 1942 World Exhibition; after WWII the area to the east of Basilica di S. Paolo was intensively built-up. In order to allow cars and buses to move between these new quarters and the city a large section of the walls to the right of the gate was pulled down; after WWII also the walls between the gate and the pyramid were demolished. The small church shown in the plate was pulled down in 1849 during Garibaldi's Defence of Rome in order to clear the area in front of the walls from all obstructions. The church was known as S. Salvatore de Porta. Today Porta S. Paolo is at the centre of a very large square and it is close to a railway station, to the underground and to the metropolitan railway to Lido di Ostia; these transportation facilities make the square an easy to reach gathering point for political rallies: to learn more on how the Romans voice their views click here. 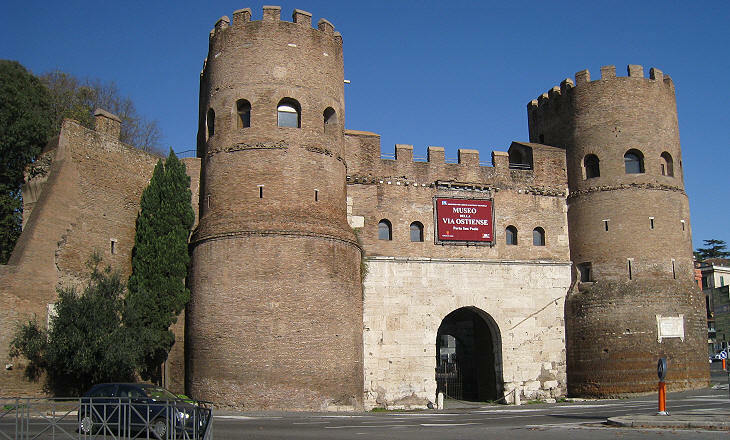 The original name of the gate was Porta Ostiensis as it led to ancient Ostia. It is very similar to Porta S. Sebastiano; initially it had two openings; Maxentius built a wall behind the gate with two other openings and strengthened the towers; Emperor Honorius replaced the two external entrances with a central one, thus the gate started to be called Trigemina (three born at the same time) because overall it had three exits. In the VIth century the Byzantine General Belisarius raised the towers to their current height. 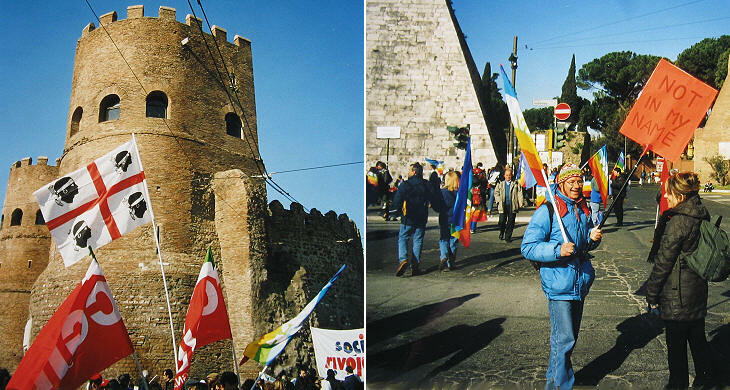 Massive walls and high towers are of no avail when those who should defend them accept bribes; in 551 the Goths bribed the Isaurian garrison of this gate and they conquered Rome. The Isaurians lived in the region of today's Konya and were regarded as valiant and trusted soldiers by the Byzantine emperors for whom they formed the personal guard. 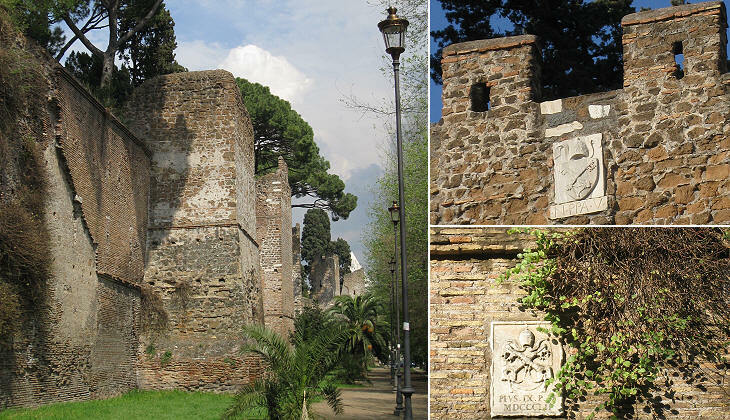 Today Porta S. Paolo houses a small museum about the gate itself and Via Ostiense. The interior of the gate can be seen in another plate (11-ii). At the end of the civil war between Octavian and Antony, Egypt became a province of the Empire. Many Romans were fascinated by some aspects of the Egyptian culture; the most evident sign of this fashion is the number of obelisks which were brought to Rome. 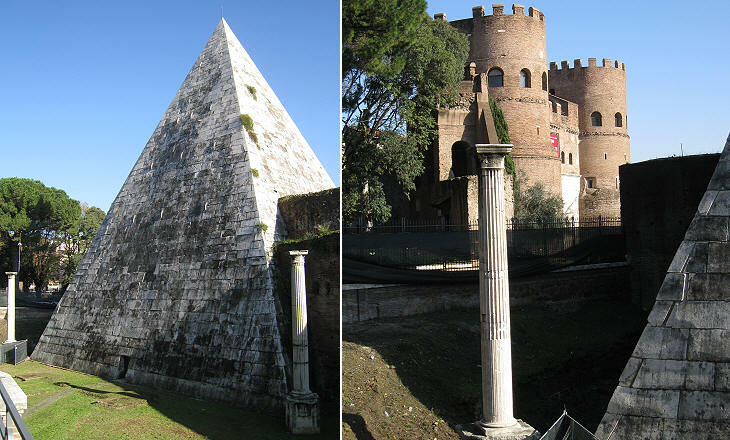 Caius Cestius, a very wealthy Roman, chose for his tomb a pyramidal shape rather than the traditional circular one (see Tomba di Cecilia Metella, which was built at approximately the same time); we know that he had been praetor (an annually elected magistrate), tribune of the people and epulonum, a member of a group of seven priests who superintended the solemn sacrificial banquets; he was a brother of the Cestius who built the bridge at Isola Tiberina and he was a friend of Marco Vipsanio Agrippa, son-in-law of Emperor Augustus. An inscription found inside the pyramid quotes Agrippa among the living friends of Caius Cestius; because Agrippa died in 12 BC, the construction of the pyramid is set before that year. An inscription on the pyramid says that it was completed in 330 days. 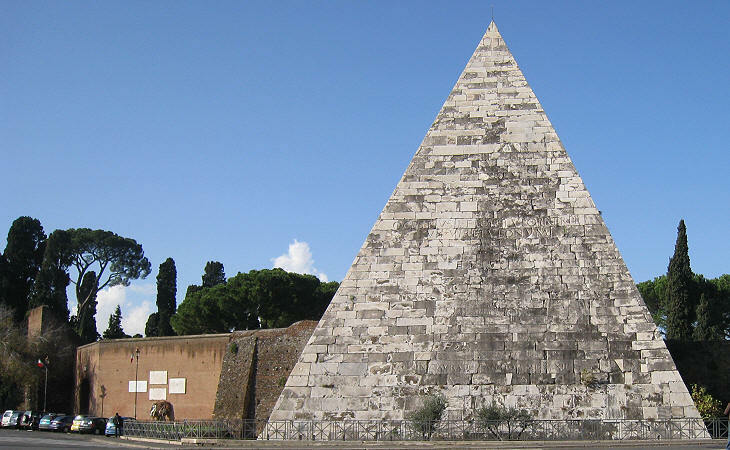 In 275 AD when the walls were built the pyramid was considered a sort of useful tower and it became part of the curtain; this fact saved it because it was maintained and not deprived of its Lunense (from Carrara) marble facing. In 1656-63 Pope Alexander VII extricated the deeply embedded monument, restored its marble facing and reconstructed its tip. The excavations led to finding two columns and the bases of two other columns. A narrow passage was dug to reach the burial chamber which was found empty; it is decorated with grotesques and it can be visited by small groups. Notwithstanding the fact that a large inscription mentioned the name of Caius Cestius, during the Middle Ages the pyramid was thought to be the tomb of Remus, the twin brother of Romulus, the founder of Rome and it was called Meta Remi (another pyramid near what is today Via della Conciliazione was called Meta Romuli, but its ruins were demolished at the time of Pope Alexander VI). Vasi had a special devotion for Pope Benedict XIV Lambertini (he was not the only one, because this pope from Bologna was very popular for his simple manners and understanding of daily life issues). This explains why in his guide to Rome Vasi showed almost all the initiatives taken by this Pope. Fabbrica delle Polveri means gunpowder factory. Pope Benedict XIV built near Porta S. Paolo (inside the walls) a little magazine which still exists. Low buildings (now used as houses) surround the original entrance to the magazine which is decorated with the coat of arms of the pope and a celebratory inscription. Fabbrica delle polveri is depicted in one of the rooms of the Vatican Library in a series of paintings celebrating the improvements made to the City of Rome by Pope Benedict XIV. For centuries a cattle market (Campo Vaccino) was held in the Roman Forum; in 1803 Pope Pius VII relocated it outside Porta S. Paolo and the street along the walls is named after this market (Via del Foro Boario - It. bue=ox). The trees of the Protestant Cemetery make this stretch of walls very picturesque. Read Henry James' account of his visit to this Cemetery in 1873. Read William Dean Howells' account of his visit to this Cemetery in 1908. 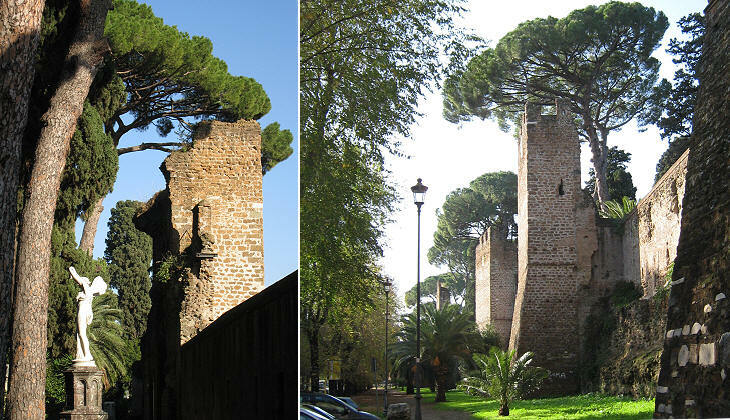 Porta s. Paolo Questa anticamente chiamavasi Porta Ostiense, come la via, perchè alla città di Ostia guidava; e prima che le mura della Città si distendessero fino alla divisata piramide, questa porta stava più addietro, e dicevasi Trigemina, dalla quale uscirono i suddetti santi Apostoli Pietro e Paolo. Ed è notabile, che da questa porta fino alla basilica di s. Paolo, abbenchè vi corra più di un miglio, vi era un portico sostenuto da colonne di marmo, e coperto di lamine di piombo, per guardare dalla pioggia, e da' cocenti raggi del Sole quei, che andavano a visitare quella basilica. Fabbrica della Polvere Era prima la polveriera presso la chiesa di s. Bonaventura sul monte Palatino; ma per ovviare ad ogni inconveniente, e pericolo, per ordine di Benedetto XIV. fu eretta in questo gran prato solitario, e lontano dall'abitato.